Safe and Sound, We do it from the Ground. GutterPRO Gutter Cleaning in Oldham. GutterPRO clear gutters in Oldham. Enter your postcode into the form or call us on 07946 310 465 or 0161 7130 512 and we’ll book you in. We will send a booking confirmation email with your address, the price and what time we will arrive on the day. 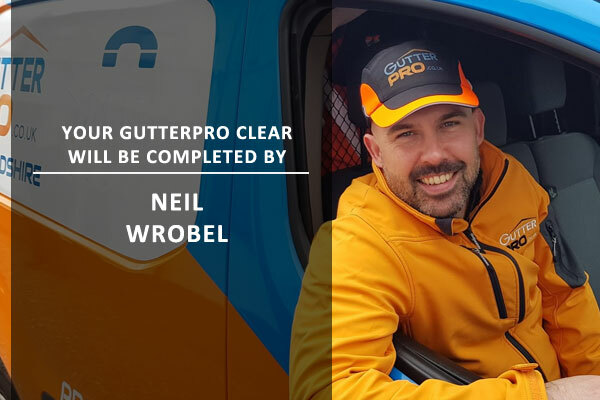 It also has a photo of Neil, who will be carrying out your gutter clear. You’ll get a text reminder that we’re coming to clear your gutters, and when we are on our way, you’ll get a link to track us as we drive to your home. When we arrive, we’ll introduce ourselves and carry out a safety survey and a camera survey to get the ‘before’ pictures. Neil will complete the clear, and then do a final survey to get the ‘after’ pictures. At the end of the job, you’ll see exactly what we have taken from your gutters, and how clear they are. You can pay by cash, cheque or card, and your invoice will be emailed to you. Not in this list? One of my Gutter Cleaning colleagues may be able to help. Call head office on 0161 7130 512 for more information.